This chapter uses the questionnaire survey method to examine the socially responsible values of university students in Hong Kong. 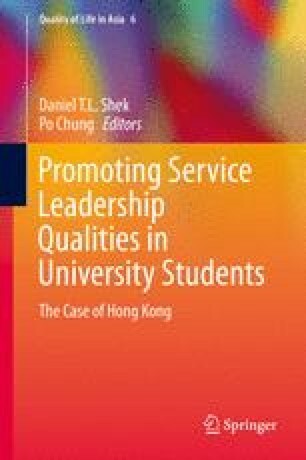 It aims specifically to test the reliability and validity of the Socially Responsible Leadership Scale (SRLS) – a framework widely used in American higher education – as an appropriate tool to measure the leadership capacity of Hong Kong university students. The survey instrument used in the study captures the data related to Hong Kong students’ scores on the seven values (including Consciousness of Self, Congruence, Commitment, Collaboration, Common Purpose, Controversy with Civility, Citizenship) of Socially Responsible Leadership Scale (SRLS) and the students’ attitude toward change and Leadership Efficacy. Apart from demographic factors, it analyses the relationships between students’ university experience and their capacity for socially responsible leadership. The discussion of SRLS also makes reference to the Hong Kong Institute of Service Leadership and Management (HKI-SLAM) approach of Service Leadership, both of which define leadership as a valued-based process for the purpose of self-enhancement (individual), service to others (group), collaborative actions (community) and positive social change. The data discussed in this paper was collected from a questionnaire survey of undergraduate students in one of the eight public universities in Hong Kong. The permission to use the Socially Responsible Leadership Scale Revised Version 2 (SRLS-R2) instrument has been granted by the patent holder, the National Clearinghouse for Leadership Programs (NCLP).